A grounded and authentic approach to life is an important part of how we get along with it and other people. As with all things there is a balance between being too grounded and having no sense of grounding at all, authenticity however is something to always strive for. 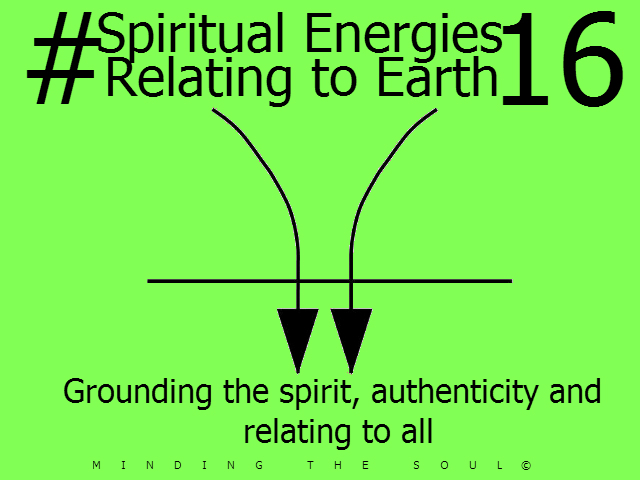 In this way the 16th image of the Soul Plan is Spiritual Energies relating to Earth. When we find we live authentically and find a balance in our grounding our relation to others improves dramatically. This symbol is an example of how the Soul Plan looks at both elements of our life. Our spiritual existence and our earthly existence. Both are inter-linked and the challenges and talents in both are crucial to achieving our soul destinies. Do you feel this relates to you on a deeper level, good or bad? Find out more about Soul Plan reading here. Hello, welcome to Minding the Soul. My name is Susan Cox. Based in Rochester, Kent I am a practitioner of holistic and spiritual therapies. I discovered my calling later in life, coming from a business background, but now live for the opportunity to help others help themselves. I hope you enjoy reading what I have to say and that we may learn from each other. I can be contacted at susan@mindingthesoul.co.uk or on 01634 303617 / 07785 917649 if you have any questions. For more information and features please visit my website Minding the Soul. I am holding a meditation evening tonight (5th April) at Borstal Village Hall, Rochester if this is an area that interests you. Find information on this event and more here.